I've never had the most white teeth in the world (I think I drink too much coffee!) 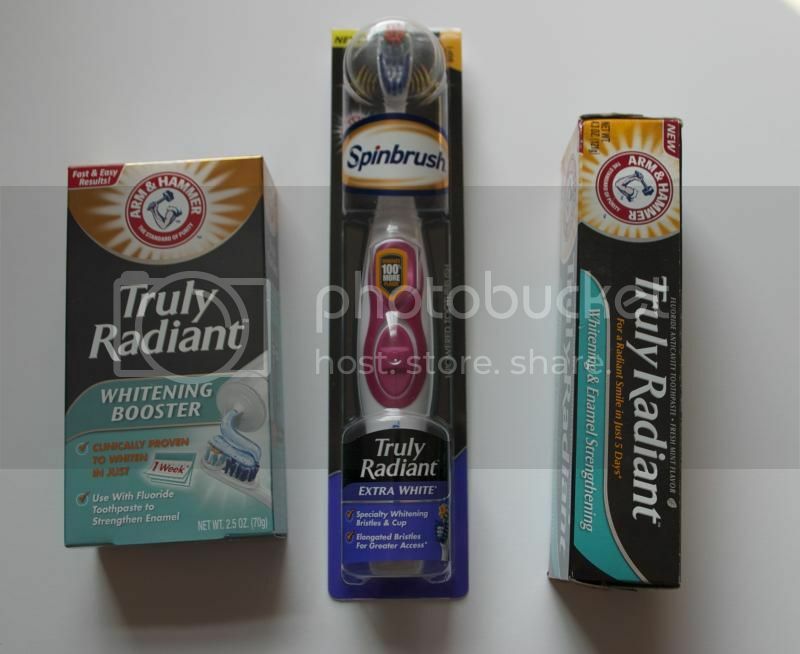 so I was excited to get the opportunity to try out the new line of Truly Radiant products by Arm & Hammer! I would obviously love to have white teeth (I mean, who wouldn't??) but I've found that I'm not too good at staying dedicated to some common methods. I never stick with whitening strips long enough (I never really enjoyed that jelly feeling on my teeth while the strip was stuck to my teeth for 3 minutes while my mouth slowly accumulated more and more spit as I tried not to drool on myself) and I never wanted to shell out mucho bucks for a profesisonal whitening treatment at the dentist. LUCKY for me though, after testing out the Truly Radiant products I can seriously say that they are easy to use, affordable, and they work! If you need to get some scientific facts to help convince you what makes these products different than just a regular toothbrush and tube of toothpaste, don't worry, i've got some! The Truly Radiant toothpaste removes 100 PERCENT more surface stains than ordinary toothpaste. The Arm & Hammer Truly Radiant Spinbrushes removes 100% more plaque than a manual toothbrush (which I can totally attest to: I normally use a regular toothbrush and my teeth just FEEL much cleaner after using the spinbrush!) Additionally, the Arm & Hammer Truly Radiant Whitening Booster is clinically proven to whiten teeth in just one week and contains 3x more whitening agent than a leading white strip. Are they perfect yet? No. But after less than two weeks of just using different products while I brush my teeth am I very happy with the results. I've been feeling a lot more radiant these days since I'm down 47 pounds, I enjoy taking pictures a lot more now! I've totally noticed a more radiant smile and whiter teeth. Do you need some more tips to bring out your inner radiance? My tips are simple: GO GET SOME EXERCISE and when you go out for the day put on some lipstick and feel good about yourself. I feel 20 times better about myself and 20 times more radiant if I get in some type of exercise everyday and throw a little lipstick on when I go out! Start using a fluoride rinse twice a day after brushing. It will help repair your enamel. Also, be sure to rinse your mouth after eating acidic foods. Don't brush your teeth right after eating those foods, though, because you will cause further damage to your weakened enamel. Find out more: gotoothache.com . 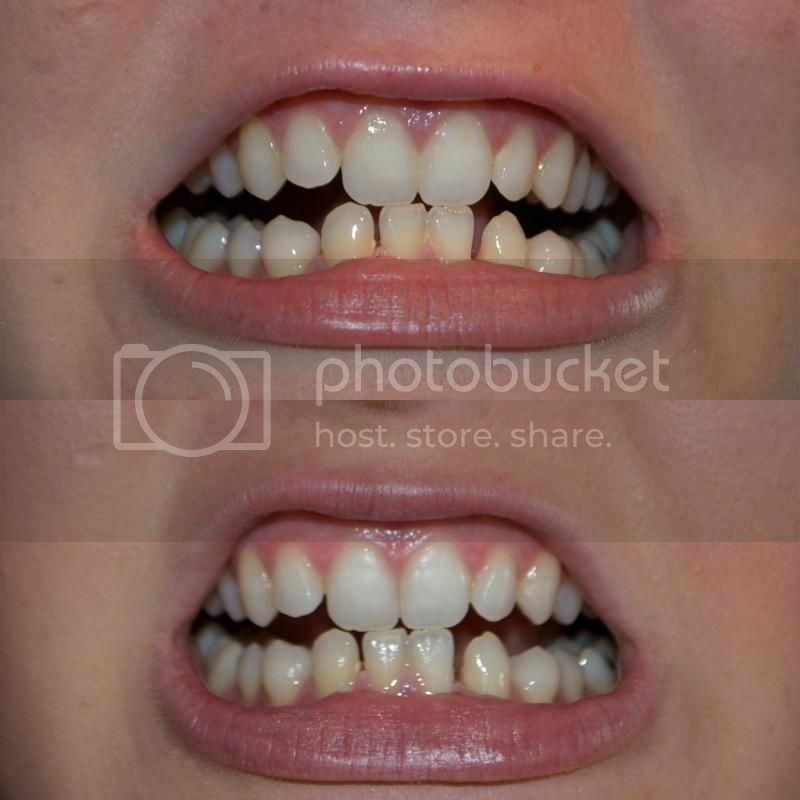 Certainly enjoy the tips as I really enjoy having my teeth look their best. I have tried many things including lemon water, but I feel that some of it may be eating away at the enamel. That is why I started making efforts to go to my dentist in Port St Lucie, Banyan Dental for now because they seem to do the best job for my teeth.